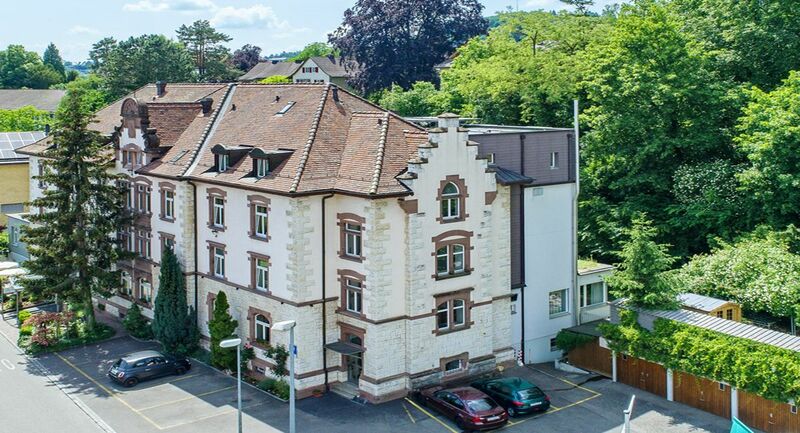 We have run Hotel Restaurant Promenade in Schaffhausen as a two-generation business since 1983. The structure was originally built in 1902 as a residential facility for the Baden Grand Ducal Customs Authorities (Germany). The hotel has its own park which still features elements of the original large-scale gardens dating back to the early 20th century, based on plans drawn up by Evariste Mereten: with its many paths, benches and secluded spots it is the perfect place to spend time and relax. Let your mind wander or take an invigorating walk along the barefoot path with subsequent Kneipp application. Savour an oasis of peace in the heart of the city. On our park terrace or in the restaurant we treat our guests to culinary delights in a relaxed atmosphere. Since 1983, we have been running the Hotel Restaurant Promenade in Schaffhausen as a two-generation operation. The building was built in 1902 for the Grand Ducal Baden Customs Administration (D) as a residential building. The hotel's own park, which still contains elements of an original garden from the beginning of the 20th century according to plans by Evariste Mertens, invites you to linger and relax with many paths, benches and cozy spots. Let yourself be inspired or refresh yourself on the barefoot path followed by a Kneipp treatment. Enjoy the 5000m2 park oasis in the middle of the city. In-house sauna for rainy days. On our park terrace and in the restaurant we spoil our guests in a culinary way amid a relaxed atmosphere.